One of the things I love most about Memorial Day is having cookouts and picnics. This weeks Picnic themed Sunday Supper is hosted by Katy from Happy Baking Days. We have an amazing lineup of options for you to bring to your Memorial Day cookout tomorrow! As long as I can remember, my Mom has always made a healthy and fruity version of coleslaw. I love it and could eat it for days. We never have a get together during the summer without a big bowl of this on the the table. The great thing about this recipe is you can improvise. Add baby shrimp for a seafood twist or give it an asian flair with the addition of ginger and cilantro, the options are endless. I like to use flavored Greek Yogurt in place of mayonnaise. Pineapple and Lime work very well and it is a much healthier option. For the Apples, Carrots and Cabbage, I use my Food Processor slicer disk to get equal consistency and size of my slaw. I top the slaw with carrot zest for a little color. If your slaw is too tart, you can add more pineapple juice. If it is too sweet, you can add more apple cider vinegar. In a food processor with the slicer blade, shred the cabbage, apples and carrots, place in a large bowl with a lid. In a separate bowl, whisk the yogurt, vinegar, celery salt. Pour mixture over cabbage mixture and toss together. Add pineapple, lime juice and sugar and salt, toss thoroughly to mix well. Add pineapple juice to taste. Check out what the rest of the #SundaySupper team is making for their Memorial Day Picnics! You can join us tonight at 7:00pm EST for our #SundaySupper twitter chat, where we will be sharing picnic recipes and tips. To join in, just follow the #SundaySupper hashtag, and remember to include it in your tweets. You can also check out our #SundaySupper Pinterest board for more delicious recipes and photos. This sounds absolutely delicious - I love the potential for experimenting with the flavours, and pineapple is one of my favourite things! What an interesting slaw! I like that you used Greek yogurt in place of mayo...definitely a good idea! I'm imagining myself on a beach...with a HUGE bowl of this! YUM! Pineapple makes this sound so refreshing! One of my very favorite fruits - pineapple. Love that you made some ingredients swaps and that it's a wonderfully healthy (good for you) slaw. I LOVE this recipe! It would be sooo good served with grilled chicken or fish. Def, making soon. You'd never guess this was a "skinny" slaw...looks delish! Love this..especially the skinny part :) Such a pretty, summer salad! I love your suggestion to use a flavored Greek yogurt! Great idea and this slaw sounds delicious. Love the pineapple/apple combination!! Plus the Greek yogurt!! Supper healthy. pineapple is one of my favorite fruits. 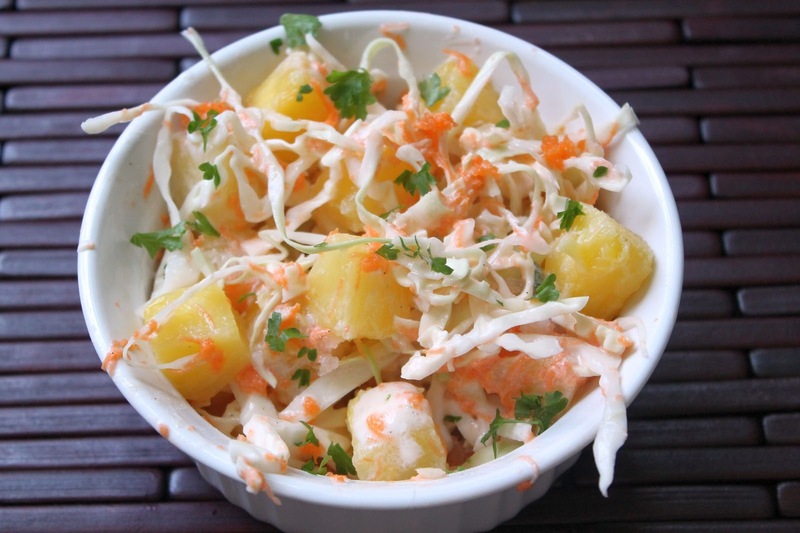 Luxurious and luscious without the calories =) Love your pineapple slaw recipe, Megan! Wow! Great idea to add all those fruits into the slaw...it sounds delicious! What an awesome Slaw! I love it. So creative and I love all the flavors. I JUST had something very simliar to this (sadly, at an after-funeral potluck lunch thing). But, I was eating it, and I was like "wait a minute...there's PINEAPPLE in this coleslaw." And I was totally weirded out for a minute. But then I was like "wait a minute....I think I like this!!!" hahaha. This pineapple slaw looks amazing. I bet the sweet/savory combo is delicious. Yum! Ohhh loving this slaw. I love adding pineapple to things, makes it so "hawaii-like" :) Not that I've ever been or anything, haha. But yum! I absolutely love slaws and am always looking for ways to mix them up. Love the addition of pineapple. Fruit always gives slaw a nice sweetness. Oh this sounds like such a yummy slaw! I make one with mandarin oranges that is so good. I bet pineapple is great too. I am loving the combo of pineapple and cabbage - this is a must-try for me! oh, I love this. . I recently made pineapple slaw to eat with salmon .. it was delicious! yum!! Wow, this recipe sounds amazing, and I love that it's healthy too! Pineapple is a great addition. Oh this looks gorgeous! I'd love to try and serve it to my guests this summer :) Lovely colors too!! "add baby shrimp for a seafood twist" = oh yea! I was looking at baby shrimp in the store the other day and thinking I needed to find something good to go with them. I certainly found it!! I'm not a huge fan of coleslaw but as soon as I saw the word "pineapple" in your title I thought to myself, I'd definitely eat that! I'd also eat the baby shrimp for a seafood twist - I started drooling just thinking about it! This is a fabulous adaptable recipe. What a great traditional "slaw"!! My daughter would love this since she LOVES pineapples!! Thanks for sharing.